72 – M. Polly McKinstry, M.D. 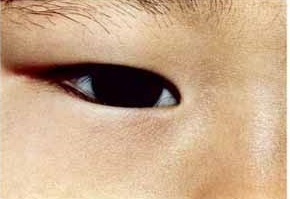 >Lower Eyelid Malposition Entropion – This patient is a child whose preoperative photo shows a condition she was born with in which the lower eyelid margin was turned in (entropion) so that the child was left with eyelashes that scratched on the cornea causing irritation, redness and tearing. Postoperatively we see the patient after an entropion repair was performed in which an incision was made below the eyelashes and the excess overriding skin and muscle was removed and the eyelashes were rotated outward so they no longer rubbed on the cornea.